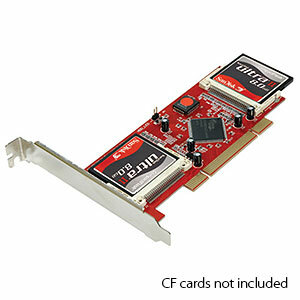 With this simple PCI card, you can quickly install a solid-state drive from spare CompactFlash drives you probably have lying around. You can connect up to four CF cards and even tie them together in a RAID arrangement. Set a card (or cards) to act as an OS boot drive for faster loading than through a hard disk. Requires CompactFlash or Microdrive cards, not included.